Adding to the hospitality of the Coachmans Inn are some pet friendly rooms which are designated and located downstairs for easy access to walk your dog. Please call 831-372-5000 for advance reservations when traveling with a pet! Pet rooms are based upon availability. Service pets are allowed in any room. 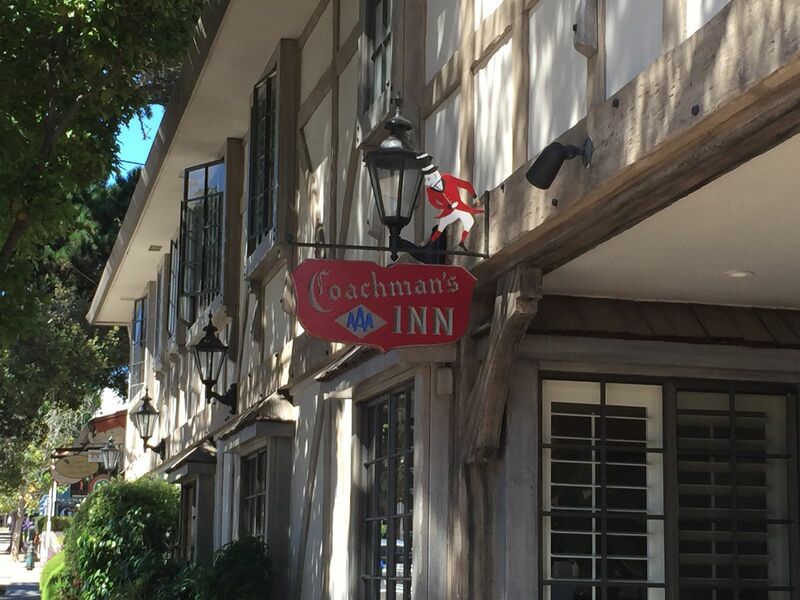 The Coachman’s Inn is ready to be your secret getaway in walking distance to world class destination restaurants, art galleries and shops in Carmel by the Sea. Nestled in the village this well kept inn features stone pavers walkways, patio with hottub and firepit and parking area. There is a sauna too, cozy on a foggy Carmel day. An exceptional Four Sisters Inn, a California collection of bed and breakfast inns. Individually decorated rooms each have full bath, microwave, coffee maker, refrigerator and seating are done in an English country style. Brass beds adorn the nice size rooms and many have fireplace with comfy King size beds.There are rooms with 2 queen beds and fireplace for adults traveling with children, a parent and on a girls trip. The front office smells of freshly baked cookies to welcome your arrival! Refreshments and coffee are offered as well. Fabulous restaurants are nearby and event sites, such as the Sunset Center are only a stone’s throw from Coachman’s Inn. Call free local Carmel Area Reservation Service at 831-372-5000 for a rate quote on a room block here and for free event planning to help plan your special occasion!